Yay! It’s time for another giveaway! 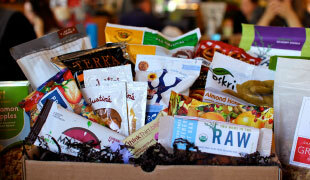 Today’s giveaway is a one month subscription to Lollihop, a tastebox of healthy snacks delivered to your doorstep. Entry for this giveaway ends Sunday, October 9.I was recently contacted by some folks who wanted to send me a product to make healthy eating more enjoyable and accessible. I’m always a little cautious with emails like this because often it’s companies with products that don’t align with my blog that want me to give them a favorable review. I don’t consider myself a big snacker, but I actually am. I guess it’s because I think of snacks as processed junk food, and I’m always munching on nuts, fruit, vegetables and other healthy goodies. But with Lollihop you get the best of both worlds! They carefully choose their ingredients. Minimally processed and certified organic, all snacks must utilize organic and nutritious ingredients in order for them to select it for their boxes. I moved all my snacks to a file drawer in my office. I often rush out the door forgetting lunch and end up buying something unhealthy from a nearby restaurant (or eating 2 cups of pecans from the jar on my desk!). My lollihop box has saved me a few times. Now, Lollihop is giving one of my readers a free snack box!!! You can have two entries to win. Entry cut off is 11:59pm Pacific time on Sunday October 9. Now hurry up and get your snack on! My favorite snack on the go is a cherry pie Lara bar, always have one in my purse and in the car. If I’ve taken the time to prepare, I love homemade hummus and veggies. I just discovered your site today and I’m finding so many neat ideas. Thanks! My favorite healthy snack is cucumber spears and carrot sticks dipped in hummus. Big fan of homemade trail mix. So versatile! One of my new favorite snacks is air-popped popcorn with a drizzle of coconut oil and sprinkled with cinnamon, nutmeg and sometimes salt. Yum! I enjoy this snack from Costco, it has cranberries, dried soy nuts, pumpkin seeds and a few other goodies. Healthy & crunchy. I have a couple favorites right now: homemade granola and the gingersnap Larabar. I love baby carrots! They’re my favorite snack! lately I’ve been enjoying ants on a log 🙂 Celery has seemed to be pretty cheap lately and it’s got a good protein kick from the organic peanut butter, it’s enough food to quiet my tummy down and the raisins are such a sweet topper! my biggest junk food weakness has always been chips, preferably with salsa. since salsa is healthy i made it a mission to find something better than chips to pair with it. the answer, sliced cucumbers! they also go well with roasted red pepper hummus. Lately one of my favorite snacks is rice cakes with sunflower seed butter, then maybe a banana or jam on top. So good! I love apple slices spread with peanut butter. My favorite snack as of late is a slice of sprouted grain bread spread with almond butter and topped off with pumpkin butter with banana slices on top. It’s so deliciously autumny, and it’s packed with loads of nutrition and plenty of yummy! My favorite healthy homemade snack are coconut date nut balls. Crushed Fiber One Honey Clusters, dates, coconut, and walnuts blended together with honey and formed into little bars or balls. Amazing. My absolute favorite snack (especially in the autumn and winter) is a baked apple. I just quarter and core an apple, put it in a bowl and cover it with cling wrap, and microwave it for three minutes. Squishy and warm and sweet yet tangy. Just perfect! I like to snack on nuts. Walnuts are my favorite.